In the Practicum, you are given a list of companies with the description of each of their projects so you can state your preferences. From your preferences, you are assigned to one of the projects based on your skills and past experiences, to create diversified groups that have a better chance of being successful in completing the task. By now, my team, working for NN Investment Partners, has basically finished the project and I can say it was a very interesting opportunity. First, my team is composed by one MBA and another MFin, both very smart and from different countries, which allowed me to learn a lot from them. Also, my project’s theme was Emerging Markets’ sovereign debt and was a great way to have a practical experience on a subject close to my roots and also on a subject (fixed income) that I had only theoretical knowledge. Everything from data collection and treatment until the statistical analysis and results interpretation will be done by your group, while also creating a nice bridge between the group and the company, providing a great chance for networking. Projects can be on site or on campus, like in my case, where visits to meet with the sponsor are usually provided by the company. Because of that, our team went NN’s New York office twice, and was very well received getting introduced to most people in the office. This is just one of the options you have during IAP, but it’s been definitely a very interesting one and if you have more questions, feel free to ask me. You can still choose not to take any classes and just recharge your batteries for spring term but I really didn’t want to miss all this. 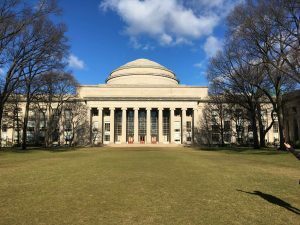 Besides that, there is something about MIT that just brings you back and makes you want to stay here to “drink from the fire hose”. Excellent post! It describes very well what the course and IAP are. Congratulations Felipe!